TEMPE, Ariz. (AP) — In the wake of another embarrassing loss, the beleaguered Arizona Cardinals have released two starters — right tackle Andre Smith and cornerback Bene Benwikere. Coach Steve Wilks also said Monday that linebacker Josh Bynes (thumb) and kicker Phil Dawson (hip) were placed on injured reserve. Wilks cited inconsistent play on the part of Smith and Benwikere. Smith, a former starter for the Cincinnati Bengals, was in the first year of a two-year contract and played 46 of a possible 47 snaps in Sunday’s 45-10 loss to the Los Angeles Chargers. Benwikere played 35 snaps and had one tackle. Smith, signed in the offseason as an important part of the rebuilt Arizona offensive line, had struggled throughout the season holding back the pass rush to protect rookie Josh Rosen. Rookie Korey Cunningham, a seventh-round pick out of Cincinnati, will move in at right tackle for Sunday’s game at Green Bay. Cunningham started the last two games at left tackle in place of injured D.J. Humphries. Wilks said he expects Humphries back this Sunday. “Corey’s playing well and we want to be able to give him the opportunity there to play on the right side,” Wilks said. Benwikere is the second starter opposite Patrick Peterson to be released this season. Jamar Taylor, who started the first three games, was released last week. The job will apparently go to David Amerson, signed by Arizona earlier this month, released, then re-signed. The 43-year-old Dawson has appeared in 305 games. His 441 field goals rank eighth all-time. But he may have made his final kick for the Cardinals, if not in his career. His job will go to Zane Gonzalez, the former Arizona State kicker who was cut by Cleveland early in this, his second, season. But there’s much more than some personnel shuffling needed for the Cardinals, who at 2-9 are tied with San Francisco and Oakland. The Cardinals need to win two of their remaining games to avoid matching the worst record since the franchise moved to Arizona in 1988. Arizona was 3-13 in 2000. Vince Tobin was fired seven games into that season, replaced by Dave McGinnis. The Cardinals’ worst record since moving into State Farm Stadium was 5-11 in 2006. 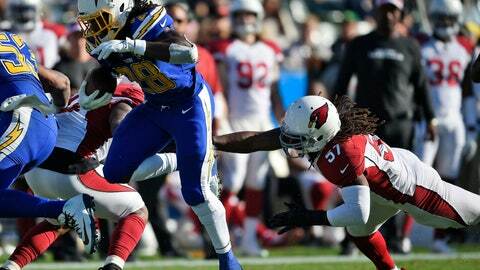 Arizona gave up 45 unanswered points to the Chargers on Sunday after taking a 10-0 lead. They ran three plays in the third quarter. Philip Rivers set NFL records by completing his first 25 passes and completing 28 of 29 overall. It’s something Rosen could learn from, he said. Wilks said he saw no sign of the team quitting.